Laufer noted that the exhibition was timely given views and discussion of immigration today. She said support from donors and museum colleagues prompted research and a reevaluation of Myers at Auburn’s art museum, which includes work by the artist from the permanent collection. The museum offers special thanks to the late Helen Farr Sloan, widow of artist John Sloan; attorney Jerome K. Grossman; Katherine Degn and Carole Pesner of the Kraushaar Galleries; and Myers’ grandson, Barry Downes. 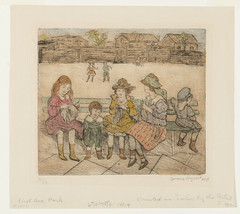 Lenders to the exhibition include the Columbus Museum, Columbus, Ga; Delaware Art Museum in Wilmington; the Georgia Museum of Art at the University of Georgia, Athens; Arkansas Art Center, in Little Rock; and collector Samuel Rosenfeld. Charitable, tax-deductible gifts in support of the Jule Collins Smith Museum of Fine Art or other programs at Auburn are made through the Auburn University Foundation, which receives such gifts on the university’s behalf. Donors, alumni and friends can make a philanthropic gift in support of the museum and future exhibitions like this one by contacting Melaine Bennett, development officer, at (334) 844-7945, or go to http://jcsm.auburn.edu/support/index.html. To learn more about the various means of donating to Auburn University, go to https://develop.auburn.edu/how/. For additional information about the museum’s upcoming exhibitions and programs, go to www.jcsm.auburn.edu or call (334) 844-1484.